Don’t Go to the Doctor Without Me! Don’t Go to the Doctor Without Me is your personal road map through the health care maze from wellness exams to chronic care management and teaches you how to become your own health care advocate. Uninsured or under insured, this book includes important tips on how to get low cost or free services while still receiving the best possible care. 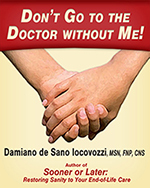 Don’t Go to the Doctor Without Me is brief, to the point and the only book to date to focus on the many aspects of a doctor-patient relationship. The author draws from his 23 years of experience as a nurse and offers all the questions patients should ask during every encounter—wellness exams, episodic illness, chronic illness—and completes the provider-patient partnership. Take control of your medical care and live a healthy life. 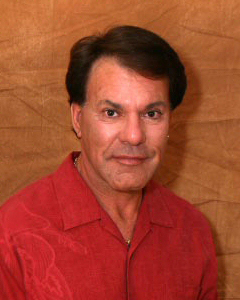 Damiano de Sano Iocovozzi, MSN FNP CNS served on the committee for biomedical ethics for the California Nursing Association in San Francisco, California. Damiano has 23 years of bedside experience as a registered nurse, clinical nurse specialist, family nurse practitioner and college instructor. His bedside knowledge, experience and skill continue to provide patients with expert care and consultation. "This is a gem for all consumers of health care and their providers. Finally a guide to make our patients active partners in their care. I really like the questions provided for the patients to ask. Dom is right on with the changes in health care and presents ways people can get what they need."